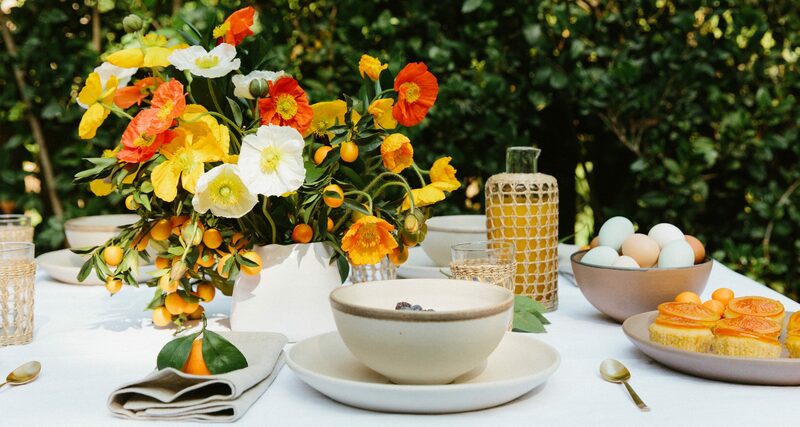 The advent of spring signals the start of longer days, sunny skies, and fresh new blooms. 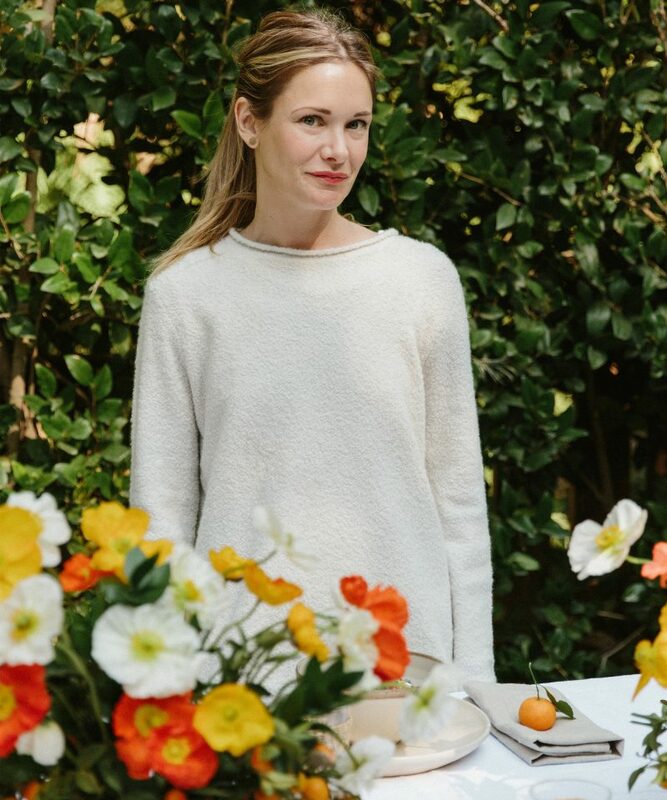 We can think of no better way to usher in the season than celebrating over a light al fresco brunch with Annie Campbell, the queen of elevating the everyday. 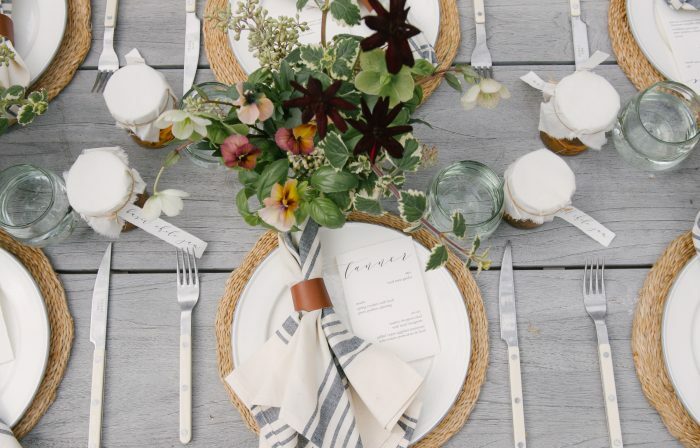 Annie’s always been adept at taking something simple and making it special, and this brunch was no exception. 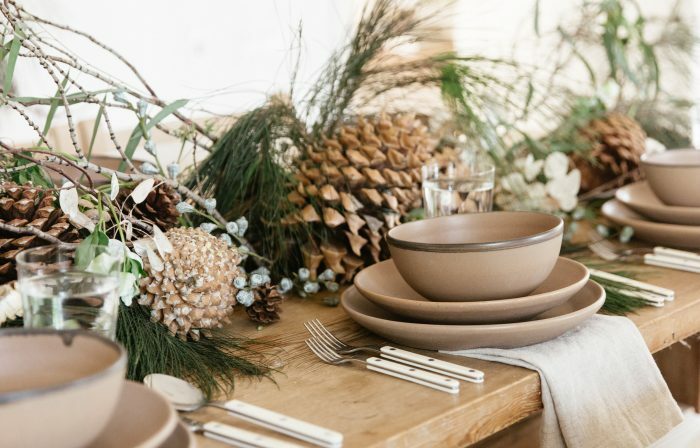 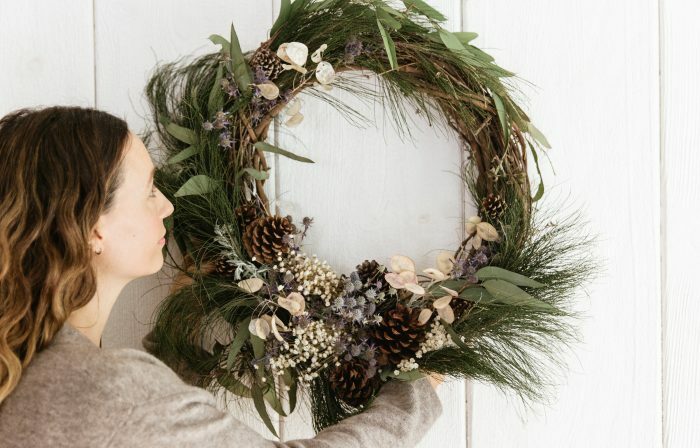 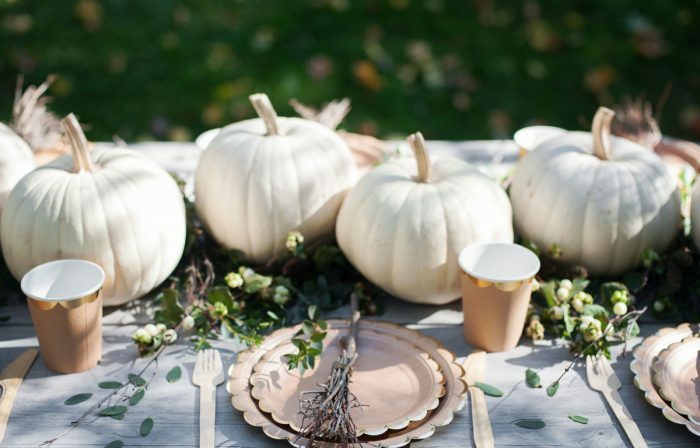 With a few key hostess notes from Annie, you can use these tabletop tips to commemorate the vernal equinox or to simply bring a bit of cheer for any occasion. 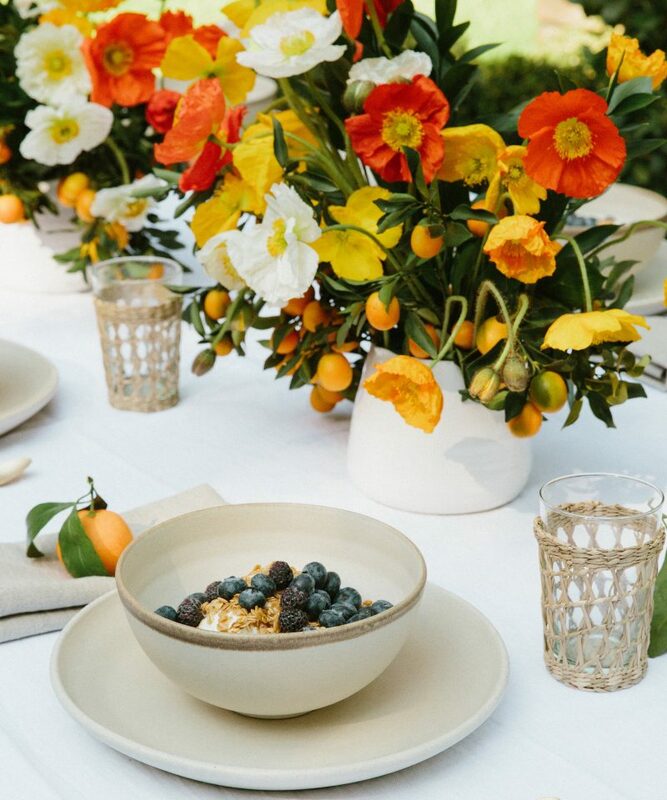 When it comes to warmer weather, we often opt for lighter fare, and bowls of yogurt topped with muesli or granola and a mix of berries fit the bill. 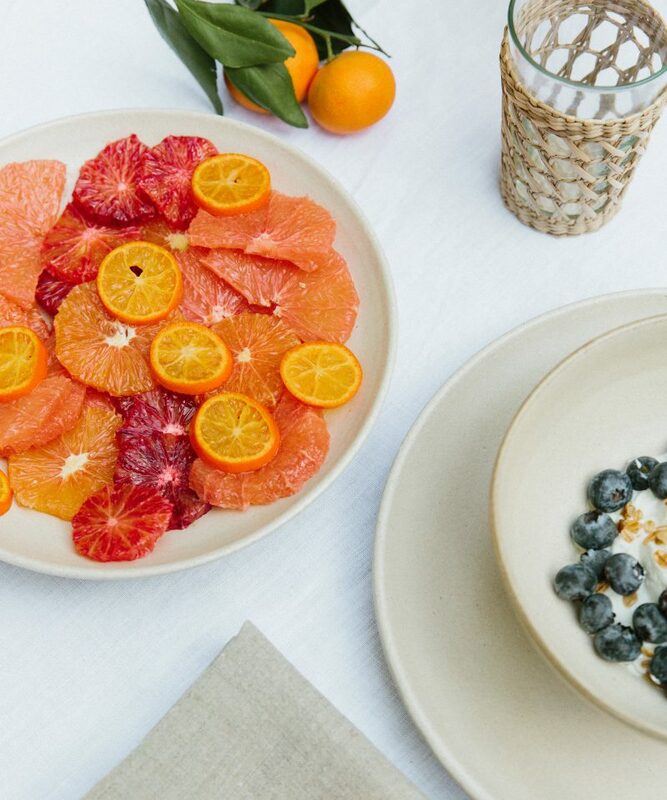 Yogurt and granola is conventional, quick, and easy, but when it sits in an earthy, handmade ceramic bowl, this simple start to the day turns beautiful. 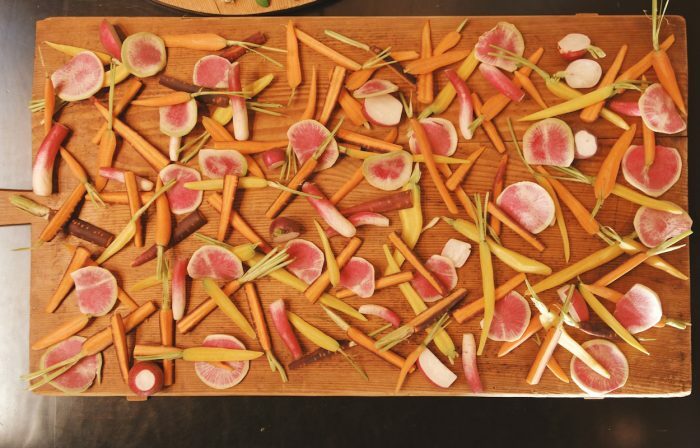 Try mixing with different toppings and mix-ins and visit your local farmer’s market to experiment with what’s available—spring is a time for new, fresh flavors, best paired with an adventurous spirit. 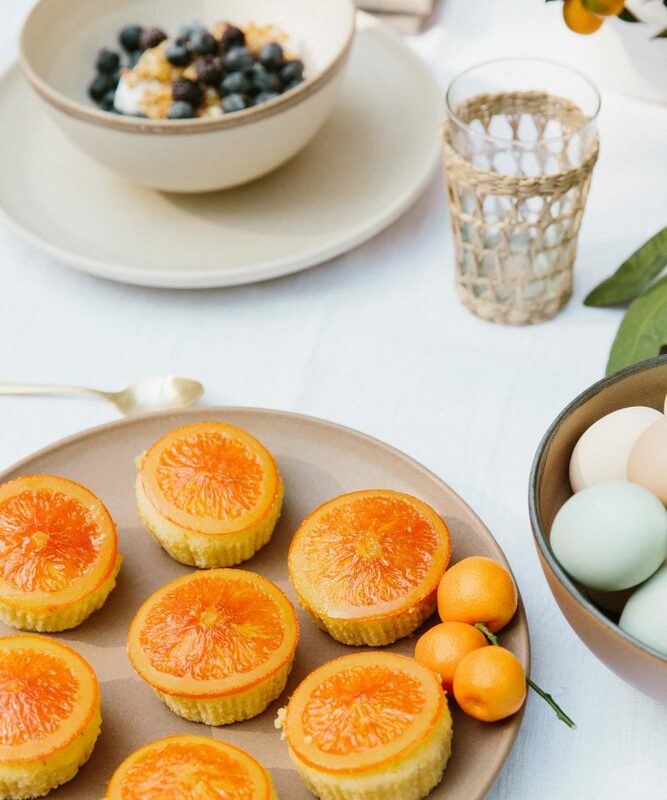 Slices of caramelized citrus slices sat atop buttery shortbread for a delightful treat of bright and tangy notes, perfectly balancing the rich and flaky pastry. 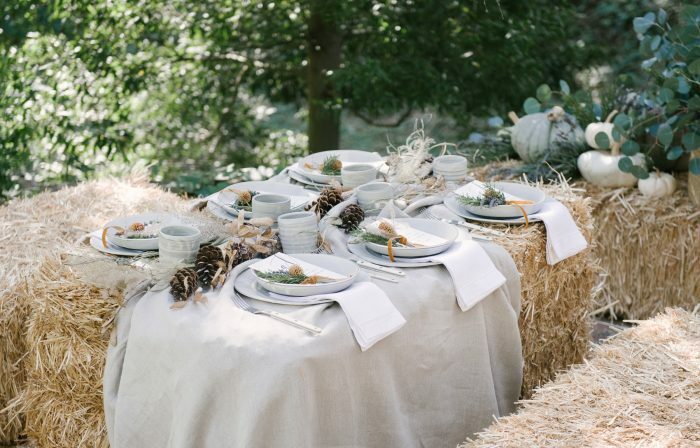 A good centerpiece doesn’t steal the show, but lies in perfect accompaniment, as a part of the natural surroundings. 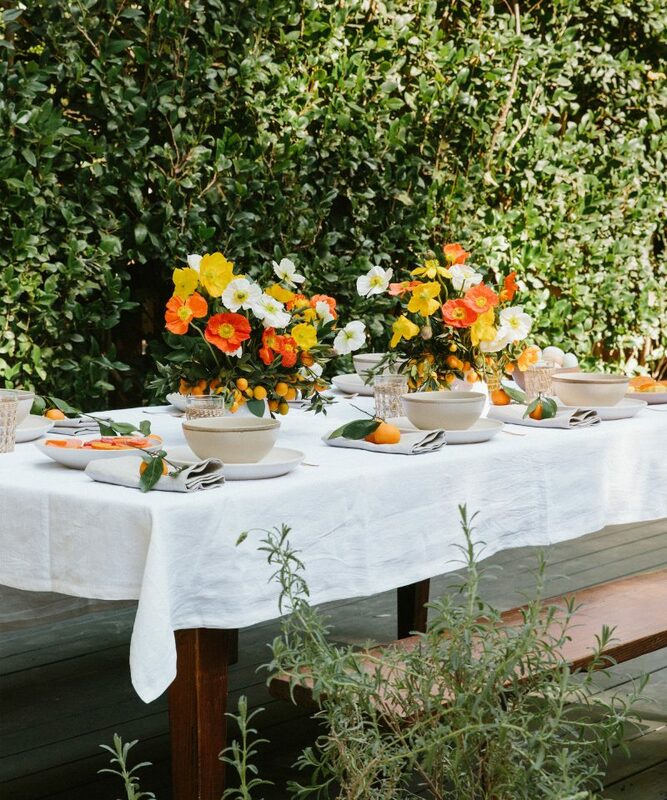 An organic arrangement of bright, cheerful poppies are balanced with a bit of the unexpected—languid kumquats drape down the vase for an atmosphere of abundance. 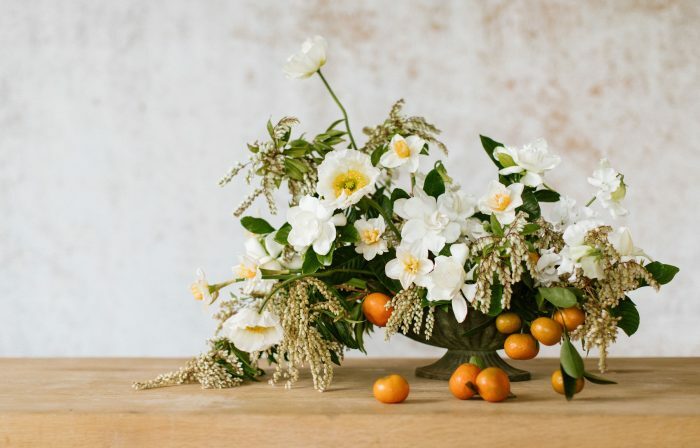 We love this bouquet for its visual beauty as well as its subtly invigorating scent. 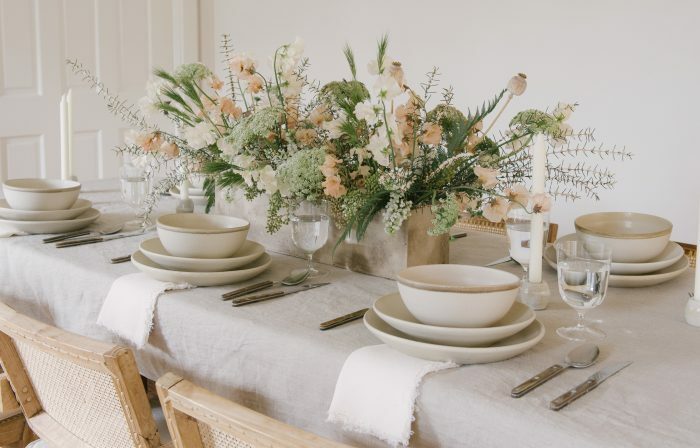 Natural fibers like linen are refreshing in spring for their airy touch and feel. 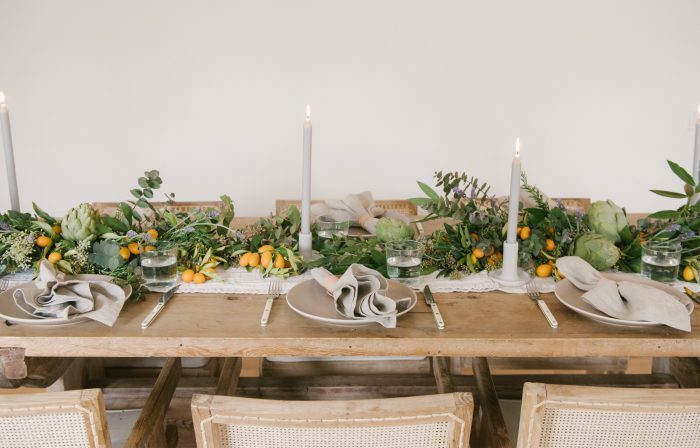 In a palette of quiet neutrals, the tablecloth and napkins serve as a solid foundation to present the citrus-centered table. 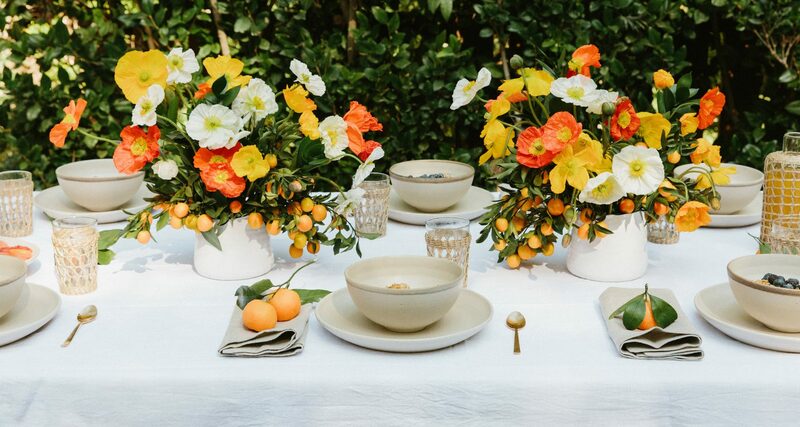 A personal touch always makes guests feel warm and welcomed, and a loose mandarin orange, stem and leaf in tact, add to the perfectly undone aesthetic of this springtime table. 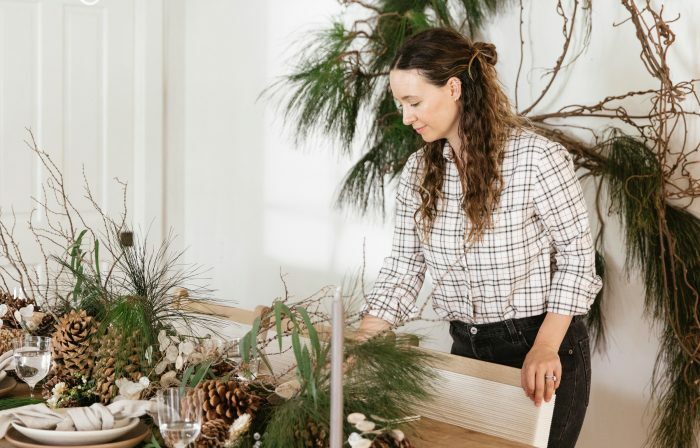 Woven tumblers and carafes (perfect for mimosas!) 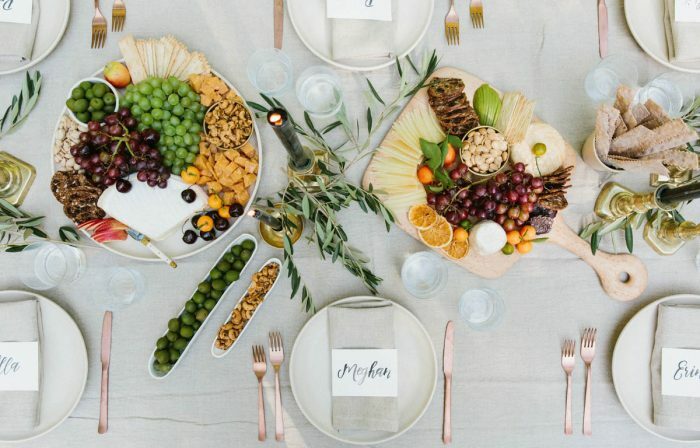 add to the wildcrafted atmosphere, while a glint of gold from Canvas cutlery anchors down the tablescape with a welcome air of elegance.